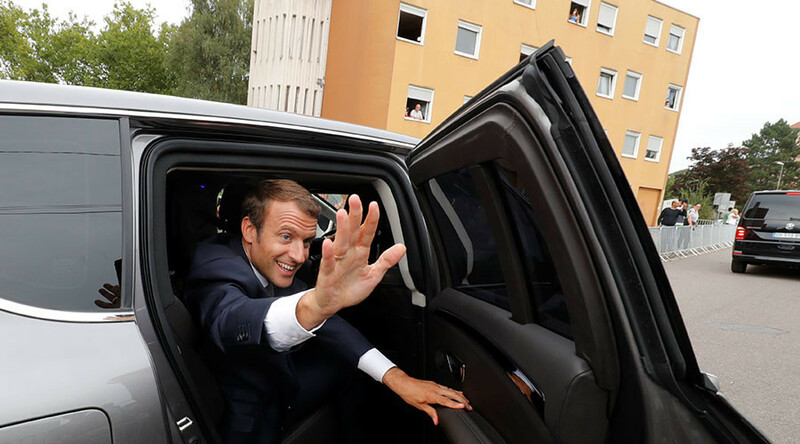 President Emmanuel Macron has been criticized for branding opponents of his labor reforms as being “lazy.” Quickly dubbed the ‘King of slackers’ on Twitter, the French leader was undeterred, though, saying he regrets nothing and aims to move the country forward. Macron’s controversial comments came while on a visit to Greece Friday. “France is not a country which is open to reforms. France does not reform... because we rebel, we resist, we circumvent. This is what we are like,” the 39-year-old president said, speaking at a French archaeology school in Athens. “I will be absolutely determined and I will not yield anything, either to the lazy, the cynics or the extreme. And I ask you to have the same determination, each day,” Macron said, prompting furious responses back home. The ‘lazy’ comment caused a stir among French politicians and on social media. Macron’s presidential rival Jean-Luc Mélenchon‏ reacted angrily to the president’s statement. “Stupid, cynical, lazy, all in the street on September 12 and 23!” he tweeted, drumming up support for the planned labor reform protests. Benoît Hamon from the Socialist Party also blasted the president’s comments. “The president is insulting people who oppose his politics. Emmanuel Macron does not love the French, that's for sure,” Pierre Laurent, Secretary General of the French Communist Party tweeted. #24hPujadas Ce que vous appelez une maladresse est à mes yeux du mépris de classe. The French President, however, appeared unfazed. “People want to distort [my comment] to create false polemics,” he said during a visit to the southern French city of Toulouse. Reforming the country's strict labor laws has been one of Macron’s top priorities. In August, his government begun the final round of talks with trade unions on liberalizing the country’s labor laws which the government hopes will reduce the 9.5 percent unemployment rate in France. Francois Hollande’s Socialist government sparked months of violent protests trying to push through a less ambitious labor reform bill in 2016. The rallies often ended in confrontations between police and demonstrators. Macron wants to grant employers more power to negotiate employment conditions with workers, which some believe will diminish the weight of trade unions. The former investment banker also wants to cap the compensation awarded by courts in dismissal cases. The General Confederation of Labor (CGT) union has already called for a massive nationwide rally on September 12. CGT Secretary General Philippe Martinez said more than 180 demonstrations are being planned across the country.